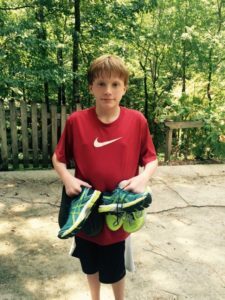 The Owens family has been leading out the shoe drive as it will benefit their adoption. Read more of their story HERE. We have watched their shoe drive unfold, starting at the Grace Klein Community lemonade stand at Chick-fil-a Greystone and will end, likely in their basement, by September 27, 2016. Pray with us that so many will contribute shoes that the fundraiser will be a huge success. 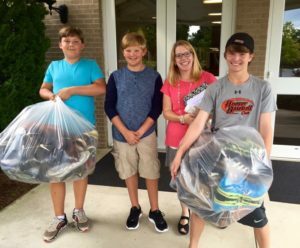 Middle Schoolers Unite of Birmingham and small groups from The Church at Brookhills are some of the awesome people who have helped collect shoes. If you scroll their Facebook wall, many friends are soliciting support from their neighbors, co-workers and friends to get the shoe donations going for the Owens adoption. The shoes will bless people all over the world, empowering micro enterprise business programs in Haiti and other third world countries, and the Owens will receive funds for their adoption. Sounds like an awesome win-win for everybody!! Can you help collect some shoes??? Can your kiddos decorate their wagon and help collect shoes in your neighborhood? Can your small group collect shoes? What about your church, kid’s soccer club, your child’s school classroom, your office? The Owens are spending a lot of time begging shoes, sorting shoes and bagging shoes. Can you join in on the fun? ?